Does anyone know if these are slated to be rolled out at more locations? Integrate schedule information with the real-time arrival info to show listings further out than one hour for people who need a long lead-time to arrange their departure (or have a long walk to the stop). Allow an option to sort by boarding location rather than next arrival. Have a different (less intrusive) effect (we currently use a ‘window-shade’ effect) for the data update transitions. Please comment and let us know if any of those ring your bell (or if you have other suggestions). Oregon’s bridges are safe, apparently. Based on a suggestion in our open thread for suggesting topics, here’s an attempt to refocus the Bus vs. LRT debate we seem to have here constantly. 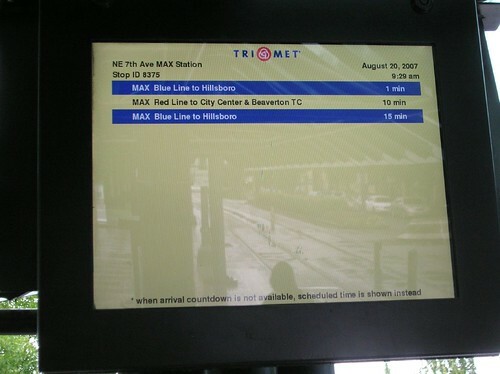 Taking MAX out of the equation (you can either assume we stop building more MAX or that we have enough money to both buses and MAX), how would we improve bus service? How and where would we improve existing service? Where would we put new service? Tuesday’s Tribune had an interesting feature article on the Portland Harbor and the conflicting demands on it: working industrial land, port facilities, riverside trails, environmental cleanup and habitat restoration. The Willamette River was Portland’s very first transportation system, and is still one of our most significant. Indeed, the confluence of Freeway, Rail and Marine transport is still one of our big economic advantages. How do we balance all these conflicting aspirations for the river and river-front? Hosts Sara & Tori will talk to Michelle Poyourow, the coordinator of the BTA’s Bike Commute Challenge, an annual competition that promotes cycling to work. An additional guest will tell us about the upcoming cycle-cross race season.